Titletown’s park, which includes the playground, game courts, field and plaza, is open daily from 7 a.m. to 10 p.m.
Ariens Hill and the skating rink are open seasonally (pending weather). Hours of operation are 4 p.m.-8 p.m. Monday through Thursday, 4-9:30 p.m. on Friday, 10 a.m.-9:30 p.m. on Saturday and 10 a.m.-7 p.m. on Sunday. Please visit the skating and tubing pages for pricing and additional information on holiday + gameday hours. 46 Below is open from 10 a.m.-8 p.m. Monday through Thursday, 10 a.m.-9:30 p.m. on Friday, 9 a.m.-9:30 p.m. on Saturday and 9 a.m.-7 p.m. on Sunday. Taverne in the Sky, Leaps & Bounds and Kohler Waters Spa hours can be found at lodgekohler.com. Hinterland restaurant and brewery hours can be found at hinterlandbeer.com. Bellin Health Titletown Sports Medicine and Orthopedics hours and appointment information can be found at bellin.org. Take 41/141 south to the Lombardi Exit (exit #167). Turn left (east) on Lombardi Avenue and continue for approximately 1.5 miles to Titletown, off of Lombardi Avenue and South Ridge Road. Take I-43 north to Highway 172 west. Take 172 approximately 6 miles to the Oneida Street/Ashland Avenue exit. Turn left (west) on Pilgrim Way to Oneida Street. Turn right (north) on Oneida Street. Continue north on Oneida Street for approximately 2 miles. Turn left (west) on Lombardi Avenue and continue past the stadium to Titletown off of Lombardi Avenue and South Ridge Road. Take Highway 41 north to the Lombardi Exit (exit #167). Turn right (east) on Lombardi Avenue and continue for approximately 1.5 miles to Titletown, off of Lombardi Avenue and South Ridge Road. Take Highway 29 east to Highway 41 south. Take 41/141 south approximately 1.5 miles to the Lombardi Exit (exit #167). Turn left (east) on Lombardi Avenue and continue for approximately 1.5 miles to Titletown, off of Lombardi Avenue and South Ridge Road. 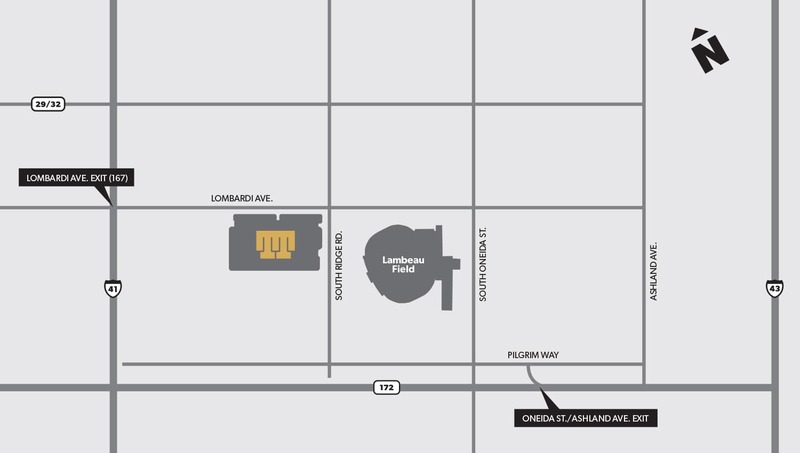 Visitors to Titletown can find parking in the lot on the north side of the development adjacent to Lombardi Avenue, with reserved parking for Lodge Kohler guests, Hinterland Restaurant and Brewery, and Bellin Health Sports Medicine clinic patients at each facility. Overflow parking on non-gamedays can be found across South Ridge Road in the Lambeau Field parking lot. The Titletown parking lot off of Lombardi Avenue will open for paid parking each game; however, guests parking at the Titletown parking lot will not be permitted to tailgate in the lot.